Short Term Trading forex trading links forex trading books market statistics trader values euro and us dollar Shocks Crashing Oil is rising and the U.S. dollar is falling? Here is the good news. Greece has now enough money to cover ends meet. It will not leave the euro zone over the short term and there will not be an uncontrolled default. The other side of the story is that debt stays enormous and the austerity plan is very (too) ambitious. Greece does not have the resources or the will to follow-up with another round of tight measures. The euro 130 billion bailout funds will be mostly used to re-pay creditors. Little or none of it will be left to fund the deficit. A default of the country is still in the cards, in case of a low private sector participation rate of euro 14.5 billion bond redemption on March, 20/12. This week, the E.C.B. will begin another round of Long-term Refinancing Operation (LTRO). December’s injection of liquidity helped mitigate risk aversion. President Draghi anticipates the amount will be substantial. Between euro 600 and 700 billion are expected this time. The financial community will attentively watch for improvements in the credit sector, which has been under pressure. Apparently, banks have put the liquidity on hold. Recent data suggests total ECB deposit facility reached about euro 460 billion, way above euro 265 billion showed before the first LTRO deal in December. In reality, growth prospects are again shaking, as oil prices are tentatively moving to the January highs, also helped by favourable seasonal conditions. 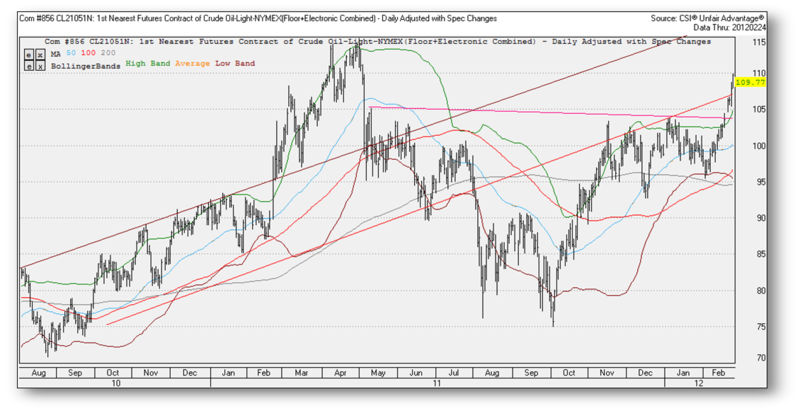 Instability in the Middle East could support oil toward the level of 120 and put pressure on household pockets once more. Last year, the increase of oil prices coincided with the U.S. dollar declining to the lows. 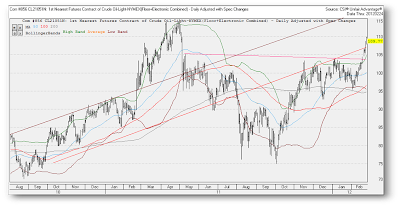 Eur/usd has reached the upper channel–line at 1.35. A break-out is necessary to lift the euro to 1.36.